Tibet has had vassal status to China for centuries. In China it is known as Xizang (meaning “Western treasure house of Buddhist scriptures”) and became an Autonomous Region within China in 1950. Tibet is the China's natural south-western border because Tibet's southern edge contains the highest Himalayan Mountains including Zhumulangma Feng (Mount Everest ➚ 29,029 feet [8,848 meters]) which stands on the border with Nepal. It is the second largest province after Xinjiang. The Tibetan Plateau is the source of the waters that become the Yarlong Tsangpo (Brahmaputra), the Indus, and the Ganges rivers. The Yarlung Zangbo flows in a deep valley eastward before turning dramatically south into India. ‘Tibet’ is a modern European name for the province probably derived from the Arabic ‘Tibat’ meaning ‘The summits’. In the distant past the Chinese called it ‘Tufan’; the Tibetans themselves use the name ‘Bod བོད’. 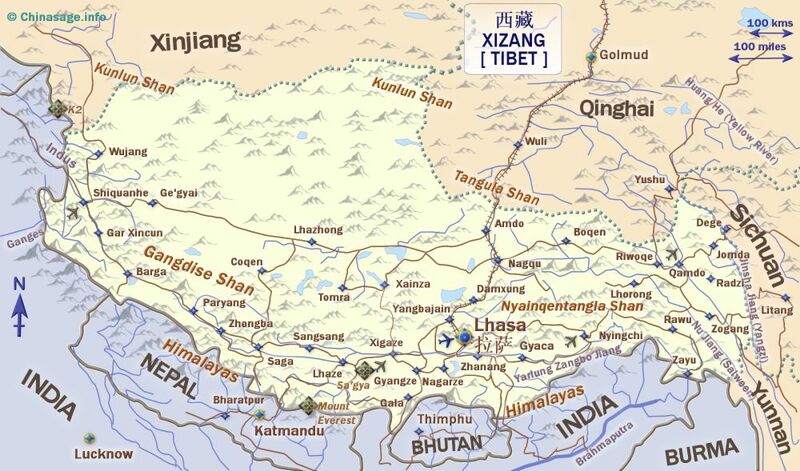 Conditions at the high altitudes are bleak; most Tibetans live in the narrow, relatively sheltered valley of the Yarlung Zangbo Jiang ➚ where the main town Lhasa is sited, which means ‘Throne of God’. Tibetan rather than Chinese is the main language, which is closer to Burmese than Chinese in form, and Tibetan Pinyin is used on road signs. The Potala Palace ➚ in Lhasa is the center of Tibetan Buddhism and popular with tourists. Buddhism remains strong with most families still wanting one son to become a monk. The Palace was built by King Songtsan Gambo (617-650) for his Han Chinese wife Wen Cheng - sent to him to forge an alliance with China (Note that he also had a Nepalese wife). Potala means ‘Buddha's mountain’ in Sanskrit, it was last re-built in the 17th century by the fifth Dalai Lama. There are a thousand rooms and many grand halls. It has 13 levels and is the highest palace in the world. It was built as the residence for the spiritual and secular leader of Tibet the Dalai Lama, but during his exile has become a museum. The ‘West Main Hall’ holds the remains of the previous Dalai Lamas encased in gold coated stupas. Beneath the palace was a workshop where sutras were printed and also a torture chamber - the rule of the Lamas was not always benign. The whole palace was designed to resist earthquakes by pouring liquid copper into the foundations. It is a UNESCO world heritage site. 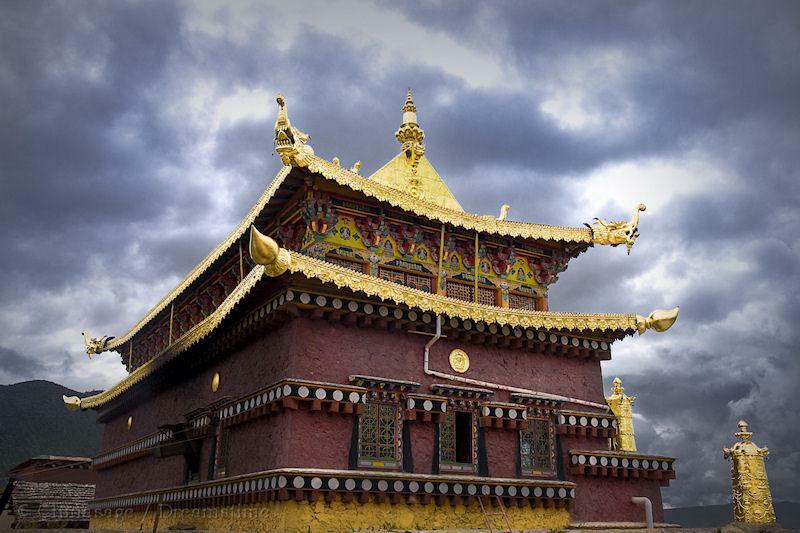 The oldest building in Lhasa though is the monastery of Da Zhao from the 7th century. It has design elements from Nepal, China, India as well as Tibet. It has a statue of Guanyin dating to the 8th century. The Barkhor quarter is the old Tibetan town with many traditional features and permeated by the smell of burning yak butter. Jokhang Temple is a sacred building within Barkhor and holds an ancient image of the Buddha. On Mount Gadan 37 miles [60 kms] east of Lhasa is one of three largest and most important monasteries in Tibet - the Gandan monastery. It was built by the Yellow Hat sect in 1409. Inside is a Great Hall that can seat 3,000 lamas. Another well known attraction is the Tashilhunpo Monastery ➚ at Xigaze (Shigatse) this is the home of the Panchen Lama ➚ (second in seniority to the Dalai Lama). The other monasteries are dotted around including Baiqoi Monastery ➚ at Gyangze; Drepung Lamasery, Sera Monastery and Zhebang Monastery. Sacred places include Yamdrok Lake ➚ and Heavenly Lake Namtso ➚. Many Buddhist monasteries have fine displays of 唐卡 Táng kǎ - a religious painting on cloth. These bright and complex images often portray Buddhas and Bodhisattvas as well as demons. Currently travel within Tibet by foreigners is tightly controlled; it is not possible to travel about on your own, you have to go as part of a group. It is also essential to allow adequate time to acclimatize for the very high altitude. The Qinghai-Tibet railway 青藏铁路 was opened in 2006, and this has greatly increased the province's accessibility from the rest of China. It is the highest railway in the world, reaching 16,640 feet [5,072 meters] at the Tanggula Pass. Tibet formed the Thufo Empire back in the 8th century and at this time it became strong enough to attack China and sack the great Tang dynasty capital city of Chang'an. Tibetan culture persists not just in Tibet but also in neighboring Qinghai; western Sichuan; northern Yunnan; southern Xinjiang and Gansu provinces that formed the Tibetan kingdom. The main cultural influence is from the local form of Buddhism - Tibetan Buddhism. The religion merged some features of Bon ➚, known for its prayer flags and wheels with Tantric Buddhism ➚. In 1641 the Yellow Hat sect beat the Red Hat sect to become the leading religious group and installed the first Dalai Lama. The Tibetan culture has its own traditions and festivals including Tibetan New Year. Tibet became part of Qing Empire China in 1705 and only had a brief period of independence after the fall of the Qing (1911-1950). In 1903 Britain, concerned with potential Russian threat to its Indian Empire to the south, sent Captain Younghusband ➚ to impose control. After beating the Tibetan Army, Britain agreed that Qing China could rule Tibet (as long as it kept out the Russians) but still maintained a formal presence 1904-1944 at Lhasa, Gyangze and Gartok to monitor the country. The Cultural Revolution (1966-75) wrought havoc to Tibet. Initiatives were imposed across China taking no account of local conditions and traditions - so wheat was planted in place of barley and more importantly the Buddhist monasteries were systematically destroyed. Of the 1,600 monasteries in 1959 only 10 survived to 1979. A rebellion in 1958 resulted in the Dalai Lama ➚ and 80,000 Tibetans fleeing over the mountains to Dharamshala ➚ in northern India (only 124 miles [200 kms] from the Tibetan border). Extensive settlement by Han Chinese began at the time of the foundation of the PRC. The politics of Tibet remain a very sensitive topic and the details of China's right to rule are disputed. Chinese tourist information exaggerates the role of the Chinese princess Wen Chang (omitting the mention of the other Nepalese wife) and the brutality of life under the lamas. Any visitor will see that Tibet is culturally distinct and deserves a degree of independence. At the Simla Conference ➚ in 1913-14 China agreed that Outer Tibet would be given full autonomy but the Republican government then disowned the accord. Potala Palace, Lhasa, Tibet. October 2010. Everest, the highest mountain in the World is often thought of as being located in Nepal rather than China. The truth is that it is in both countries, the border runs directly through the peak. In China Mount Everest is known by a transcription of its Tibetan name ‘Zhūmùlǎngmǎ Fēng’ 珠穆朗玛峰 (meaning Holy Mother). The British surveyor Sir George Everest ➚ working in India measured it as the highest peak 29,059 feet [8,857 meters] in the Himalaya - he did not actually climb the mountain. It is said that he measured it at exactly 29,000 feet and fearing no one would believe it was exactly a number of thousands added a couple of feet to the figure. The measurement has since been revised upward, and actually the mountain continues to rise an inch a year due to the tectonic forces pushing up the whole Tibetan plateau. The mountain has a number of ice forests or 'seracs' between 5,300m and 6,300m above sea level. The ice is formed by opening of cracks and cervices in a glacier that can lead to pinnacles of ice being left behind. Access to Everest can be made from the Friendship Highway ➚ that runs from Nepal into China. The north-east ridge route is on the Chinese side of the mountain while the slightly easier south-east ridge route to the summit is on the Nepalese side. Notable wildlife on its slope include the snow leopard and lynx. Tenzing Norgay (Nepalese) and Edmund Hillary (New Zealand) were the first mountaineers to reach the peak on 29th May 1953. A Chinese team of Wang Fuzhou, Qu Yinhua, Xu Jin and a Tibetan, Gong Bu attempted to reach the summit in 1960, they came very close but whether they made it right to the top has been disputed ➚ as no photographs were taken. The second highest mountain in the world is usually called K2 ➚ and is on the China - Pakistan border in neighboring Xinjiang. At 28,251 feet [8,611 meters] it is less than 3% lower in height than Everest. 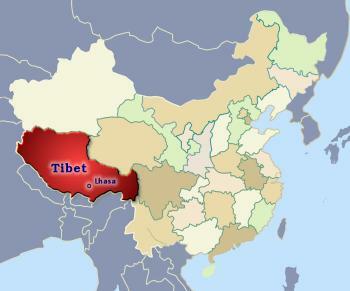 Tibetans form the dominant ethnic group, with a minority of Han people who live in the main towns. The forced settlement of Han people in Lhasa has given the city a Chinese feel; however tensions between the Tibetan and Han peoples continue to produce unrest at times. There are continued protests by monks, sometimes committing suicide by self-immolation ➚. Tibet remains a poorly developed, desolate province compared to the rest of China. It has the feel of a different country. Yak herding is the key agricultural activity of Tibetans, but only in the southern valleys. Very little grows over much of the central and northern regions due to lack of rain and the extreme altitude and cold, it is dotted with large brackish lakes. Some barley is grown in the warmer valleys. 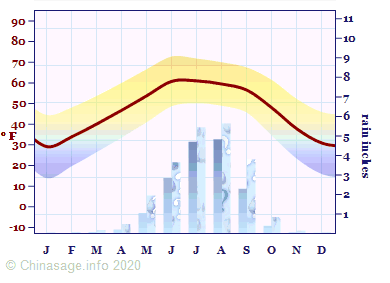 It is very cold in winter and cool in summer with very limited rainfall which falls only in the southernmost area. Citation information for this page : Chinasage, 'Tibetan Autonomous Region China', last updated 27 Nov 2018, Web, http://www.chinasage.info/maps/tibet.htm.